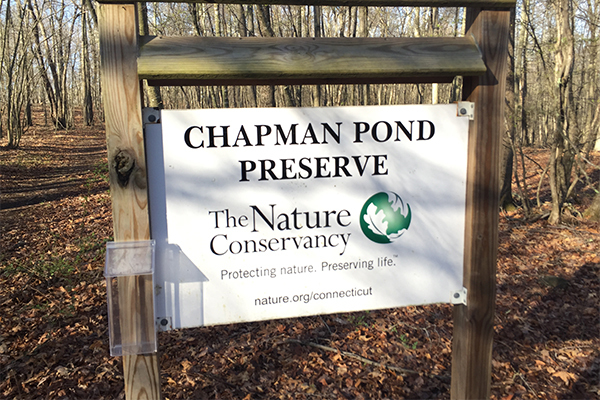 I've never visited a property of The Nature Conservancy that I didn't thoroughly enjoy, and the Chapman Pond Preserve is no exception. On a beautiful Sunday morning in mid-April, I had the entire place to myself. 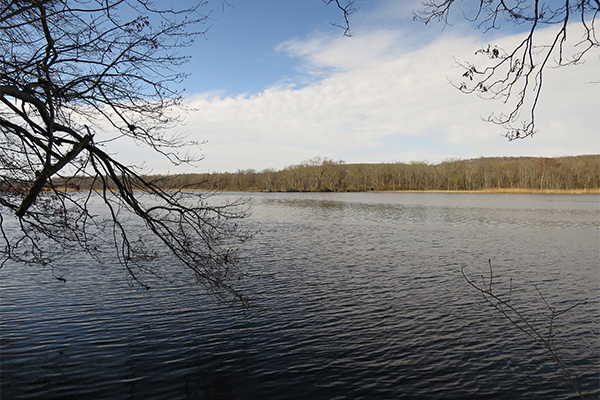 I walked the entire 3.0-mile loop instead of just hiking out-and-back to the falls, enjoying its various waterfalls and the tranquility of Chapman Pond. 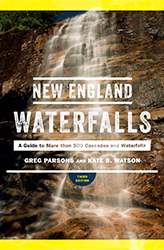 I discovered that the 10-foot falls were only a stones throw from the pond, and they cascaded and slid down into a pretty but shallow little pool. I took a little rest on the footbridge above the falls before bushwhacking down to the pool, which offered the finest perspective of the falls. There was another waterfall about two-thirds of the way into the loop, but it was too far off in the distance to obtain a great view (and it was clearly located on private property). Follow the blue-blazed trail that heads southwest from directly ahead of the parking area. After 200 feet, you'll reach where the trail splits to complete a loop. Stay straight here, heading in a clockwise direction. The trail will lead slightly uphill for a moment but then continually descend over the next 0.5 mile where you will reach a small stream. Cross this stream and another one 0.2 mile further. 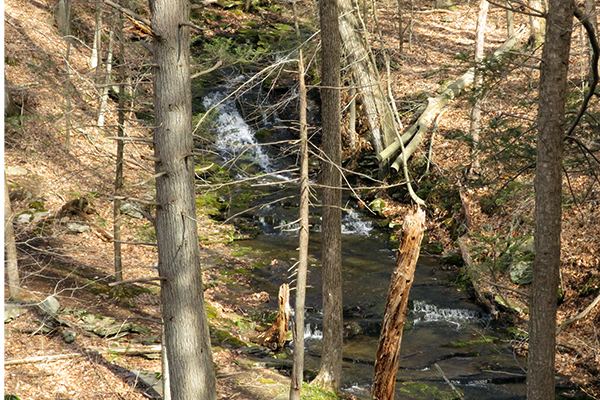 After hiking for 0.9 mile, the trail will cross over a more substantial brook on a footbridge. 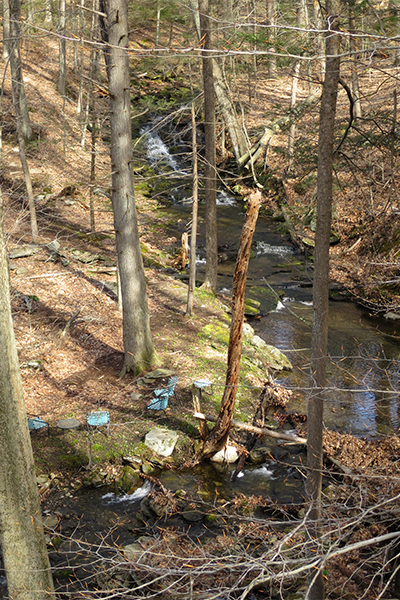 Both of the small cascades are visible downstream from the bridge. If you take the time to bushwhack downstream along the left side of the brook, you'll discover far superior views of the falls from the pool below them. 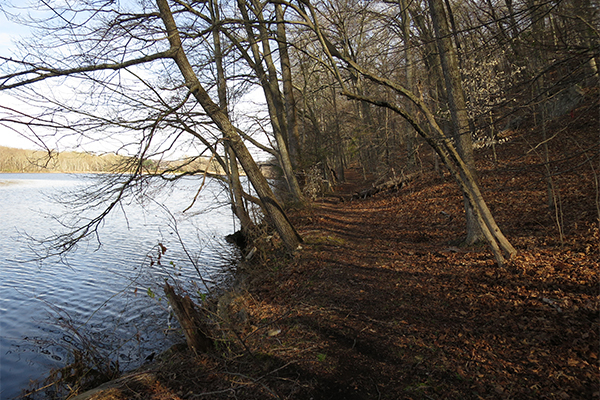 From the falls, it's only 0.1 mile further along the trail to reach peaceful Chapman Pond. 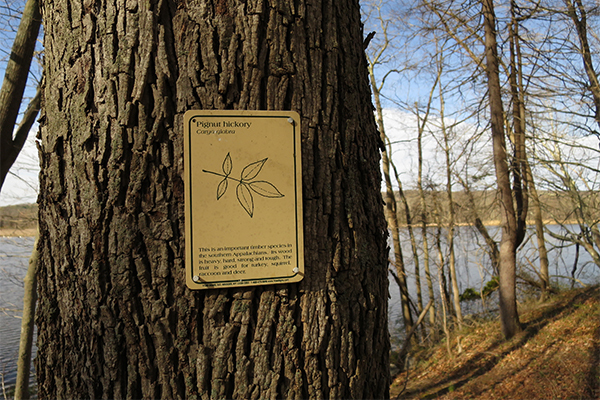 To return to the trailhead from either the falls of Chapman Pond, you can either return the way you came or extend your hike into a 3.0 mile loop. The loop is well-blazed and easy to follow. There are several small streams to cross along the way, but there are stepping stones to assist you in that. This loop (in the exact direction I have described) would make for an excellent, moderately challenging, trail run. 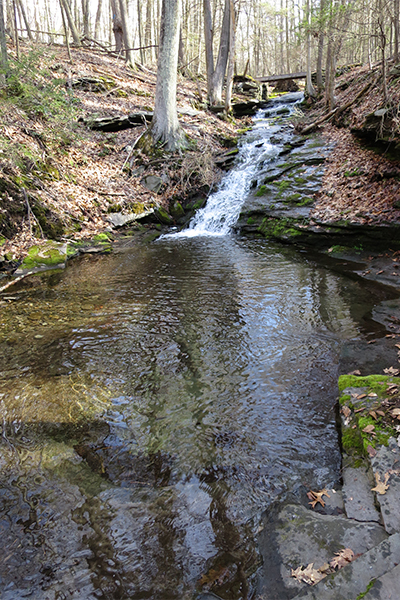 If you elect the loop option, look for a 10-foot cascades on your left at about the 2.0 mile point. 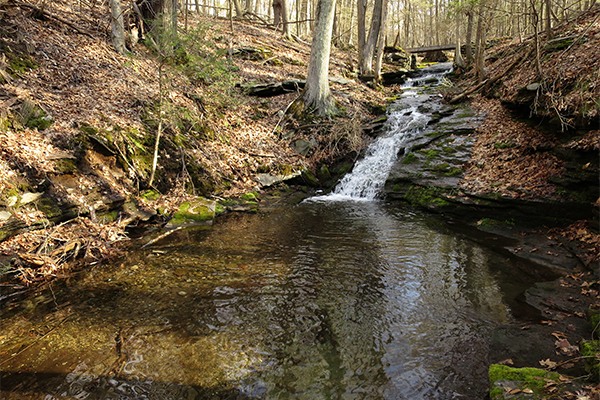 These falls have some potential but are located on private property, a few hundred feet outside the boundary of the preserve. From Middletown, take CT 9 south to exit 7. Take CT 82 east through Haddam and into East Haddam. Continue traveling on CT 82 east (driving in a southerly direction) for 1.2 miles past the junction of CT 82 and CT 151 north and take a right onto River Rd. Follow River Rd south for 0.3 mile and turn right onto a narrow dirt road immediately before a major curve in the road (avoid the private driveway that is 100 feet before the curve). Drive the very rough dirt road 0.1 mile to the parking area at its end. This road is not suitable for low clearance vehicles (park somewhere on River Rd instead).